It was a shul built in 1906, and now it lays in the heart of Boro Park. It is located on 12th Avenue and 41st street and is called Chevra Anshei Lubawitz. In the middle of June, unbeknown to the membership, the shul was sold to developer Moses Karpen, a friend of one of the board members. Karpen’s plan was to demolish the shul and convert it to six stories of apartments – but leaving at least part of the bottom floor to be used as a shul. The building was sold for 3.1 million dollars on June 14th. This week, however, a Brooklyn judge blocked the demolition at least temporarily, after some of the members argued that the sale was based on misrepresentations. According to media reports, as part of the deal, the synagogue would pay $3 million for the first floor and basement of the new building. This is $100,000 less than they received for the property. The Daily News reports that seventeen members of the synagogue claimed that the two board members behind the sale made no effort to seek other offers and that the building was never offered on the open market. One of the many halachic issue involved in this bizarre arrangement is whether it is appropriate to knock down an existing shul for the purpose of building housing on top of it. The Shulchan Aruch Orech Chaim (151:12) writes as follows: One must be careful from using an aliyah (an attic or second floor) that is above a Bais HaKnesses regularly for a use which is “legnai” – indecorous or unseemly. The Shulchan Aruch cites sleeping or lying down as an example of an unseemly activity. This would therefore include six floors of apartments. Rav Karo further writes in the second part of this halacha that there is a question as to whether other types of activities are permitted in such a location. The Ramah adds a qualification. He writes that this halacha only refers to a Shul which was initially established as a shul. However, in a building that was originally built as a regular building and only afterward established as a shul – there one may indeed lay down. The cornerstone of this shul shows conclusively that it was originally built as a shul. The Ramah’s leniency stems from a ruling of the Piskei Mahari. On this Ramah, however, the Mishna Brurah (OC 151:42), citing the Mogain Avrohom who cites the Kneseth HaGedolah, remarks that, nonetheless, one who is concerned for his soul should distance himself from this – especially in the section above the haichal. The Shulchan Aruch’s question in the second part of the halacha about other types of activities is explained by the Mishna Brurah as being based upon the following question: Do we compare a shul to the Azarah in the Bais HaMikdash, in which case the upper sections do not retain a state of holiness? Or perhaps we compare a shul or Bais HaMidrash to the Haichal of the Bais HaMikdash itself, in which case the upper sections would retain a state of holiness? The TaZ in Orech Chaim 151:4 writes that when he was younger he and his children lived in his Bais Midrash in the city of Cracow, above a shul. He writes that he was punished severely and lost his young son [in an apparent fire]. He placed the blame on the fact that he lived above a shul. Someone once told this author the following story after having moved to Kiryat Sefer the day it opened over 25 years ago. “For quite a few years all the shuls were in miklatim [bomb shelters] and there were some serious accidents, cholim etc. We went to Rav Chaim Kanievsky [the son of the Steipler Rav mentioned earlier] and asked him what type of tikkun [rectification] we can do. He asked us where the shuls are. Telling him that most of the shuls were located in the miklatim under apartments, he mentioned that his father was very makpid on this. Together with the builders of Kiryat Sefer and the gabboim, a date was set for all shuls to be moved into temporary caravans or permanent buildings. There are, of course, leniencies when the shul was only made after the building was built, and the Aruch haShulchan writes that it is a mussar matter rather than absolute halacha. However, in this case, it was originally built exclusively as a shul. In recent months there have been a number of cases involving shuls and their sales or alleged sales, and one questions whether they were done under the guidance of a recognized Posaik. Next articleWelcome To: Charidy 360° – A Full-Service, 360-Degree Fundraising Solution Revolution! This is not a Chabad Shul, for some time the Rov there was chabad that’s it. It was originally a Nusach ashkenaz shul and the Rov in the late sixties and early seventies was a litvishe. Very interesting, however just want to point out that this was never a Chabad shul. The former name was Chevra “Anshei” Lubawitz, not Chasidei Lubawitz. The shul was founded by non Chasidim from Lubawitz. I’m quite surprised R Hoffman, that you would inject yourself in a issue that you know nothing about, spreading half-truths about a story you only found out about yesterday. This is not a recognized Chabad shul. It has never been a recognized Chabad shul. At one point in its hundred-year history, one of the rabbis were afiliated with Chabad. It never had a relationship Chabad or Lubavitch in any way. Secondly, it wasn’t unbeknownst to anyone. The main instigator preventing the sale was actually present and voted against the sale. How can he claim that he wasn’t notified about it? Furthermore, notices were given about the meetings, with at least two public meetings with the board of directors and members. This information can be gleaned from court transcripts and the New York daily news, where it seems most of this information is coming from. As for complaints that members were never notified, Mollen says the sale was brought up in two board meetings before a vote was taken. One of the members against the sale admitted he attended three meetings where others talked about possibly putting the building up for sale, court records show. Creating the impression that this was done without the knowledge or consent of the shul leadership and members is wrong and pejorative. Claiming there are 50+ members because, out of simple convenience people daven there sometimes is silly. They are not members. With the same logic does Shomer Shabbos shul have 3, 000 members? If you would see the amount of people that show up there regularly for mincha, you would think so. But that’s obviously not how it works. In regards to the question of building housing over a shul, thankfully Boro Park has respected rabbis who are perfectly capable of deciding this question. It just so happens that according to the building plans, the main sanctuary will be built with an unobscured Skyline. Housing will only built at the front end of the property, not directly over the main sanctuary. Firstly, aside from the issue of building on top of a shul – there is another very very serious prohibition about knocking down a shul – even if one plans to rebuild it there. This is found in Shulchan Aruch Yore Deah Siman 252. Secondly, I have been to the shul and it is not in dangerous shape which is one of the heterim – there is no heter to my knowledge of knocking down a shul to make money off the property to create condos. You write “Thankfully, Boro Park has respected rabbis who are perfectly capable of deciding this question.” Yes, but who are they? Who is the Posaik that permitted knocking down a shul that was built as a shul to make way for a developer to make money in selling condos? Finally, while you, an anonymous blogger, who attacks this article states that everyone knew about it, I have been told otherwise by members. If, as you say they knew about it – then why would they wait to try to stop it? How the attorney general could have allowed this sale in the first place is somewhat perplexing. I would welcome any clarification, I have no interest in this matter, other than that halacha should be maintained and that Shulchan Aruch should not be trampled upon in order for some people to make money. The first and third points are the same. There are qualified and respectable rabbis here in Boro Park that can and have rules that it’s not a problem. But that’s not the point. 2. Are you a qualified engineer to decide whether or not the building needs repair? To decide if the building should be condemned? To decide how much it would cost to repair the building? With all due respect, stick to what you know. 3. Everything I’ve noted in terms of The Facts of the story are in published reports by the very newspapers you used. I even quoted what they wrote verbatim. 4. As to why they would wait to try to stop it, ask them who is funding there cause? Lastly, There is no reason why the Attorney General would want to stop it. Your only concern is the Halachaic aspect of the plan. That may be true, but as I noted, it was already decided otherwise. By rabbis just as informed as you are. I’ve already debunked your issue with the process. I don’t think matter should have anything to do with whether it is a Chabad shul or not. This is a shul, regardless. For what its worth, the original Constitution of the shul does state, even in the shul’s name itself, that this is a Nusach Ari shul. Sounds pretty Chabad to be. Regardless, it seems that you are well aware of what is going on there. SO can you explain us something simple? Why is it okay for a mispallel from a nearby shul to inject himself in this one, and within two years sell off the building when there are mispallelim for YEARS here who didn’t know. You know better than me that all this is a sham designed to transfer ownership of the shul to a young upstart ‘Rav’ that has a shul nearby. You sound pretty involved in the unpublished parts of the plan. Would you care to name a single Rav that did approve of this plan? One? This has nothing to do with Rav Unsdorfer who has a shul three blocks away. It has everything to do with two people, one of whom is a convicted felon, lining their pockets. I have no idea what you’re talking about. The fact is that the full membership and officers of the board voted. At every vote, some people lose. That’s a natural part of democracy. There are people today who don’t think Trump is our president. They question his legitimacy mostly because they lost the election. Those are the facts. Everything else is hearsay. Do some members opposed the sale? Yes. Was the sale approved by a wide margin? yes it was. Was the entire membership notified about the impending sale? yes they were. Did they have a chance to voice their concerns? Yes they did. Are there some worshippers who think they’re members and they’re not? Yes, there are. As you so aptly noted, the shul has a constitution that explicitly states who’s considered a member and who’s not, who’s considered an officer who’s not, who gets to vote and who does not. So we’re left with is you not liking who the developer is or some of the people involved. That’s your choice. But this isn’t legal matter, neither is it an Halachic matter, much to R. Hoffman’s chagrin. PS, R Hoffman was contacted by one of the people involved with this sale. That individual gave him some more information that would help alleviate some of his concern. response was ” I am not a reporter. For shame. yitzchokm: Why are you not responding to the question the Rabbi asked? ” Who is the Posaik that permitted knocking down a shul that was built as a shul to make way for a developer to make money in selling condos?”. An idiot can notice that all you are doing is being a troll. Seems like a fairly simple question to answer. Now you changed your tune and claim its not an halachic matter at all. Are you changing your tune now? They are proposing to destroy a shul, and you claim its not even a question to ask of a competent Rav? To paraphrase you above, are you a qualified Rav to decide whether or not a mikdash me’at can be torn down??? If indeed it has nothing to do with the Rav from three blocks away, why doesn’t he publicly say so? Yitzchikm, you seem to take great offense from Rabbi Hoffman’s article. I knew nothing about this issue ontill this article. R’ Hoffman is bringing up a very legitamate point, and you seem to be offended that he even dare mention it. I can only suspect that you have some serious involvement in this sale/profit building. And when someone asks you, what’s the heter? You basically say, I have my Rabbi, but I don’t want to tell you who he is, or what he said, just mind your own bussiness… and don’t mix in. Can anyone else see how this stinks? Oh, and you should have some more respect for R’ Hoffman. Judging by his articles he seems like a talmid chacham. At this point, I believe that there is no real Rav or Posaik that sanctioned this violation of Shulchan Aruch. There is no heter whatsoever to knock down a shul of a tzibbur and to build housing on top of it – even if one designates another area for a shul. A shul is a mikdash me’at. It is sad that the people involved have to violate Shulchan Aruch and the sanctity of the last vestiges of the Beis HaMikdash in order to make their money. And while they do so, they denigrate anyone who raises a voice of concern or protest. How is this ant different than being mechalel Shabbos to make money? Being mechalel a shul is almost the same. @ytamjn21 it is also alleged that both of those people happened to just have purchased a summer home upstate this year before the summer. Timely coincidence. Destroying a beautiful historic shul to build a more modern one is one thing. But all this talk about building a new shul is just a pretext for building a 6 story apartment building with no regard as to how it will destroy a neighborhood that is already overly congested. Sounds greedy and selfish to me. Interestingly, the placard in front of the building does not mention the apartment complex at all. I guess the board members knew that people would be up in arms if they caught wind of it. Are they planning to include a parking garage in the basement along with the mikvaos and simcha hall? I don’t know which Rav, if any at all, Mr Karpen consulted before he bought this building and decided to knock it down and build another structure with both a shul and housing units. What I do know however was that it was not Rabbi Hoffman. I also have not seen any complaints from local, i.e. Boro Park, Rabbonim. If Rabbi Hoffman had wanted to start a genuine leshem shomayim halachic discussion that would have been fine but why is YWN giving him a platform for a personalized attack on Moses Karpen [who I do not know and whose name I had never heard of until I read this piece two minutes ago]? And if he’s unnamed, so what? Does that make it less real? Why is the name important? To satisfy Robby Hoffman’s curiosity? Is that is that what’s important here? I think the larger question is writing an article about specific people without verifying the facts first. I believe that is an important concern. Does that make me a troll? When do I change my tune? I noted that Boro Park has respected rabbis, and that they have a pasak. There’s no reason for him to respond to rumors and innuendo. You sound surprised he doesn’t want to speak with you. He’s not obligated to. At this point you’re a journalist. A well versed journalist that happens to be a rabbi. But a journalist none the less. And a journalist that already took a side. When he formalizes his opinion in writing you can have a field day debating him. Although he is a world-renowned posek I’m sure he’ll answer your questions respectfully. If you have a problem with over congestion bring it up with your local planning board. It has nothing to do with the issue at hand. Seems that you were hired to protect the developer and YOU don’t know the facts! I’m davening there for over 20 years. If the management can’t take care of the Shul, the solution is NOT selling! There are plenty good candidates that would be glad to take over the management of the Shul. I don’t know all the by laws, but in the past I gave around $100 year for a seat when I lived in the neighborhood. I agree that I don’t know if I was a ‘member’ or not as per by laws but they took my money and I had a seat. Last time I passed by my name was still on the paper. I did see a sign about a meeting a while back however it was postponed as well as I was told it was about replacing the rabbi. NO HINT ABOUT KNOCKING DOWN THE BUILDING. I have spoke in recent months and it seems that the people involved decided to hide the facts so they put up a sign about a meeting(thinking it was about replacing the rabbi) when in fact it was about selling the building! Now we know! The sale was the the new gabbai best friend! (Or family member) upon further research 4 members knew about it nobody else. I happen to be in real estate and as a paying person (don’t know if I’m a member)I would at least of liked to have the opportunity to be somehow involved, as not only was it sold in secret, but to develop we could at least gone for the best bid. Why the secrecy in who the rabbi was the gave permission as well as when the sale was (in advance) and bidding options still remain a mystery. Where there is smoke there is usally fire..
As we go in to the new year we should all come clean with all our agendas. I also don’t see any Borough Park Rabbinim defending the sale. The Satmar Beis Din is fearless, the fact they aren’t defending Karpen is very telling. Besides, there is a recording where Asher Gluck admits he has no Psak. 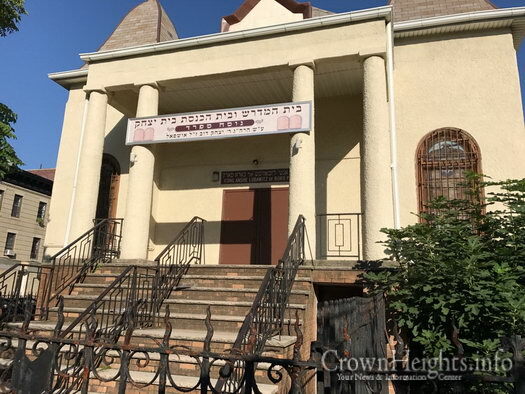 The opposing side had no issue publicizing that the Crown Heights Beis Din issued a ruling that it is a Mitzvah to challenge the sale in court. Rabbi Hoffman had no issue writing a public oped challenging the developer. I don’t see any reason a posek would object to the psak being publicized. Most people in the area though this was a landmark so nobody thought this could possibly happen. It seems that this might have been a way for some people to be fooled as well as earn a profit on the side. I was told the AG was reluctant at first to approve, but when nobody apposed it (nobody knew) they reluctantly agreed. Now that the sale came to light, there are a few past mispallalim that are strongly apposed. If their action are clear, let them have a public vote only for people that daven there, and see if this is the correct path, rather than hide behind the cloak and say we did what the ‘correct policies and procedures’ were. This is a shul not a buissness. I would Pro Bono someone from my legal dept. To make sure the sale gets reversed. I am also told that the developer had a already rented a small shul to make sure no one complains where will the mispallalim daven. If you had read the entire article you will see this was publicized by the local secular media – not R Hoffman. It is sad that the entire discussion revolves , if it’s “chabad or member qualifications” etc, yet there is NO HETER to demolish a shul, i.e even if the entire board agrees. Moreover, even if you do find some ‘heter’ i doubt you will find anyone willing to reside in such property , as the consequences is something no one in their right mind is willing to risk. This is not the first time it has been done and didn’t end up right. Regardless of the halachic issues, it sounds like a really bad deal for the shul. They get a mere $100K for prime BP property? Yes, they also get some space for a shul, but they already have that. Of course they are all up in arms. Did you bother asking any Rav? Does anyone recall the magnificent Agudah Shul in Williamsburg on Bedford Ave? Where is it? Gone. 14 families are leaving there, and a shul – much smaller – is on part of the first floor. This shul is in poor condition, in order for it to stand another 30 years, will require a million dollars investment. There’s no funds for that. It bothers me that the writer didn’t even bother to call the shuls Ruv, before posting his opinion. How much kickback is the gabbai getting for his approval of the sale? Lol. I’ve been writing on this forum for 10 years!! You admit you don’t show up there regularly, that you moved away. You admit that everything you’ve heard is second-hand. That’s hearsay. Did you take them to Bais Din? Did anybody? Why in the world would satmar bais Din come out and show support if they weren’t asked to? In fact, the only reason why the Crown Heights Beis Din is involved is because one of their four members, Rabbi Reitport, had his sights on the building years ago and failed. Rabbi Reitport was the shul’s rabbi a while ago, and still lives in Boro Park. So answer your question, everyone involved here in opposition has an agenda. Your concerns are noted and I’ve answered them above. I don’t know the exact terms of the deal, but according to what I’ve read here and in other media reports, the deal is that the congregation receives 3.1 million dollars for the property. Once the shul is rebuilt, they can buy it back for three million if they choose to do so. At that point the congregation will have a steady income due to the rental money they’ll be able to tap into. SO rabbi reitport had his sights on it and didn’t get it but somehow you did. Kudos to you and the profits made. Could you please verify why a board member/convicted felon recently stepped down? What a shame that ppl feel the need to make maclokos. I won’t comment (right now) on the Halachah aspect, but it is definitely shocking. This landmark (designated as such or not) going down will be very sad. By now there is no doubt that you are hired by the developer! If YOU write that you don’t know the exact terms of the deal, how do you even try to challenge this issue. A. I daven there almost every day. 1) Only davening here for less than two years. 2) Is a member for longer time in another Shul nearby and is very close to the rabbi there. C. He arranged to invite his friend/rabbi from the nearby Shul to become the Rabbi in Anshei Lubavich BEFORE he FORCED OUT the current Rabbi. I am sure chabad is done solving all problems in crown heights that they have to come to boro park to mix into my private business. A.A. cute. I started writing on this blog 10 years ago in order for me to have an opportunity to try to protect my friends who are trying to rob a congregation blind. Is that your Angle now? B.1) I don’t see the relevance. This was voted voted for by the board. C. That’s not true. The current Rabbi contract ended. He left willingly. D. It seems that your link didn’t attach properly, but the money I’m referring to is money that will be raised by the rentals of the facility itself. E. So? You’re proving that this isn’t the fly-by-night operation. Congratulations. Someone from your side is lying. I have never seen so much hate in my life. Please read what AA us saying and not covering the rest up. He is daven in there 20 years. Please Re read my post as I have moved away but I still stop by very often. I saw the sign myself and asked what it was about. I also still pay my dues. Not everything is hearsay as you may want people to think. The 4 people referred to above (2 are old times and have no clue of the details (one is 90+) the other two are the new gabbai and one member that only daven there on shabbos. So yes I Do know very well what goes on there. I help be mashlim the Minoan there many times until the shachris Minyan was cancelled. You can challange me anything about the shul since Mr Goldberg sold to woman’s league. I was involved in other board meetings after rabbi raiport and the next rabbi as well before rabbi same (who us being forced out. Not to mention the zloz boat ride.. need I say more? Why sell? Why keep it a secret? Why not allow a bidding process? Bottom line. If you use bi laws to ignore the facts on the ground. Nobody want to sell unless somebody us making money on the side. The sign about a meeting were deceptive and I’m glad rabbi hoffman and others are getting involved. There are,already a team of 20 people that are ready to show up with all legal means to stop this current sale. When would you like to set up a meeting in the shul and ask all the people rather that play with 4 members,voters rights,board members etc. This is a shul… there were many offers from rebbelach, that,are ready to join and pay and keep the shul afloat. After seeing all this hate is it still a wonder why I had to hire body guards? My private business!! Ha! I thought this is all about the shul! So, you hired Rav Unsdorfer to take over the shul, fired the existing rav, and Unsdorfer’s father approves of it?? I’m happy the shul is now going to have real income and membership. Do you know when the new shul is going to be ready? It’s only fair people should have access to housing. I posted links to offer actual proof, but YWN has a no link policy. Sorry. This is my second try. I don’t know who AA is, so I can’t say if he is a regular mispallel. You say he is. You keep mentioning the many members against the sale. Are you a member according to the shul’s by-laws? How many members do you suppose there are? As I mentioned earlier, most of the people who davened there weren’t members. For the same reason why Shomer Shabbos Shul doesn’t have thousands of members just because thousands daven there. Buying a seat for Rosh Hasahna doesn’t automatically make you a member. Sorry, but these are the facts. I already wrote this above. Please read all the comments. this is getting tiring. As the Daily News reported, “One of the members against the sale admitted he attended three meetings where others talked about possibly putting the building up for sale, court records show.”, In other words, you should have known. Or knew and were too lazy to show up and vote. IN regards to Rabbi Samet, his letter proves that he was NOT forced out. That’s a lie. He says that he built himself a new shul and that’s why he’s leaving. HE WAS NOT FORCED OUT DUE TO THE SALE!!!!! I wish you lots of luck in your fight to stop the sale. If you think you have a case, go for it. Spreading lies and hearted won’t get you there. No, it does have to do with Rav Unsdorfer. If not for the fact that they are talking about hiring him as rav, the people who are bringing this matter to court would not have done so. It’s a shame. It’s also suspicious why R’ Hoffman mixed into this matter? Maybe it’s for the same reason why these people are going to court? You say that your writing here for 10 years (maybe, can you proof?). I assume when you see an opportunities, you offer your services (like now). A. You stated that you don’t know the exact term of the deal so PLEASE stay away from this. (unless you have a interest ($) or ask your employer for the details. B.1 & B.2 you ignoring ?? C. Your ignoring the fact that he invited his friend/rabbi before the resigning of current Rabbi. The current Rabbi was manipulated and FORCED OUT. Please read his letter and if you have the 5th you will understand. E. It shows that he pushed himself quietly only for this reason. F. It’s irrelevant for me (and on other proof that you are paid for this service). The president letter: Where was this letter 2 months or 6 months or even a year and half ago? ? ? Only now? When it’s public? All of what you read here was done in the DARK! ? ? ? I have never seen you around these parts, so I’ve no reason to try explaining myself to you. Please point to a single post you’ve written before today. If the best you can do is attack me by saying that I’m a hired goon then you lost your case. A. I’ve already answered your question, and no, I have no financial interest here. B. I answered both your points. In other news, we just had a solar eclipse. Is that relevant? Perhaps it is. C. If I can get this straight, you’re arguing for the honor of a man who explicitly says that he wasn’t thrown out. Who explicitly says there’s no story. Are you now ready to throw him under the bus because he’s not a obeying your wishes? Because he’s not playing along with this absurd lawsuit? E. If you’re looking at the situation with hatred and jealousy, yes, I can understand how you would see it that way. F. What’s irrelevant to you? That the court has on record, admission by opposition party, that they were notified about the sale? It was written for the public. If you are a member, you were notified. Unfortunately due to your efforts, he was forced to write this letter to let the world know how foolish your position is. I stopped by today, and was told by the people I know that the rav was forced to write this letter. Secondly a real lawyer was hired, no further need to respond here. Please look as you keep repeating as per laws. Really you are saying nobody is a real member and the 4 cronies that took advantage therefore to bad on everyone else. Reminding you Yom hadin is coming. You may make money and get the building. But how you can sleep at night is beyond me. According to the by laws how many members do you need? How many members were at the meeting. Let’s see the facts no hiding. Just wanted to add a little now here to clear up a misconception. Yes. The current Rabbi did quit, as YitzchokM noted above. Oddly, however, the letter inviting Unsdorfer predates the resignation letter of the current Rav by a few months. Is it any surprise that he quit? He was clearly forced out. Spoke to rav unsdorfer. He said he will address the Halacha aspect during the morning kiddish this shabbos. You are all invited to come and learn. He will take questions after his speech. It is irrelevant if the new rav was invited prior to the old rav leaving; since the old ravs contract was not renewed prior to them seeking a new rav. Most of whats being said here is nonsense. How can rav Unsdorfer pasken a shailah that will provide him with a direct benefit?? How is he NOT פסול because of his נגיעות?? This is especially troubling, because there is a very clear Halacha in שולחן ערוך חאו”ח סי’ קנ”ב and the פוסקים there, that it is an עבירה to demolish this מקום קדוש even if you claim to build a larger shul instead. There are also many other relevant איסורים discussed in סי’ קנ”א. The תוה”ק commands us: לא תעשון כן לה’ אלקיכם. This building is not at risk of collapse. Even if there may be a few issues that can use some repair, that does not חלילה give anything resembling a license to “demolish” this entire בנין (and benefit at least one rogue developer that we thus far know about). This is a very serious matter and there are severe עונשים prescribed to עבריינים. Rav moshe yosef unsdorfer (does he also have semicha in choshen mishpat?) should not wait several more days until shabbos during kiddush time to share his shtikel toirah to only the few gathered people. Yidden all over the united states are in an uproar over this מעשה חילול שם שמים בפרהסיא. This rav has a duty right now of והייתם נקיים to immediately clear the air and explain his unprecedented pask. I hope he’s not one of those “open orthodox” rabbanim.. Since he was able to give this psak already, then he should need no more time to prepare in order to explain it. Klal Yisroel is keeping a close eye on our sacred mekoimos. It is unfathomable that the רב המתיר has still refused to issue the reasoning behind this seemingly un-halachic psak din. If he really has a תשובה or shtikel toirah that he believes in, he should not hesitate to release it to the ציבור. The לומדי תורה have been tumulting about this סוגיא and are thirsting to hear if this פסק is indeed the דבר השם זו הלכה. After a research I would like to inform every body that the blogger YitzchokM is not a Innocent blogger, he is jumping from site to site to defend the group that’s Behind this transaction he gets paid for it. A.A. He could get paid and be innocent. I am busy with the development of he building and don’t have time to respond to all idiots. I have a family to feed. Get the backing of prominent Poskim/Bes Din – NOT your local-around-the-corner-kind-of-Rabbi. With all due respect – Rabbi Unsdorfer should have consulted his Rabbi as well. (the same way he consults any Shailos that are above his head). This is not a matter of Derech Eretz or not, its serious Halcaha with serious consequences. When you attack the messenger you lost the argument. By the way, it’s true. I have been writing on other sites as well. That sounds shocking, I know. Rav Unsdorfer has nothing to do with the sale, contrary to some anonymous social media rumors. He does not have to render an opinion just to satisfy your curiosity. Since this is a subject of discussion by members of his community, since this is something that’s happening literally a few blocks away, he will be delving into the issue as an Halachic exercise. It’s interesting that you’re very worried about Rav Unsdorfer’s knowledge of and semicha in Choshen Mishpat. Interesting. You accept what for the Hoffman says as gospel, yet you do not ask him for his credentials. Interesting. Rabbi Hoffman has stated his sources and reasoning for all to see, right here. Care to share “Rabbi” Unsdorfer’s? I Spoke to rav unsdorfer, He said he will address the Halacha aspect during the morning kiddish this shabbos. You are all invited to come and learn. He will take questions after his speech)….